The announcement comes amid budget tension that has resulted in the government being more restrained with its spending and the suspension of more than 200 projects this financial year. Despite the prohibitions, the government is encouraging officials and members of the public celebrate the New Year frugally and in line with Lao culture. 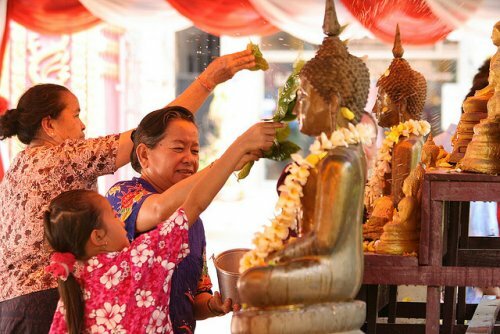 Festival activities include giving alms to monks, visiting elderly relatives and senior and retired officials and organising baci, a traditional family ritual. The announcement said New Year gifts should not be expensive, including gifts to senior officials. The government is also encouraging state officials and members of the public to use flowers grown by local farmers for New Year party decorations, promoting local production and reducing spending on expensive imported flowers. The amount of flowers must be appropriate to avoid overspending, the announcement said. As Lao New Year is a long holiday, the government has instructed authorities to pay greater attention to maintaining security and social order. Officials and members of the public were asked to be vigilant to the risk of fires and to manage road traffic during this peak time. Drunk-driving is prohibited to restrict road accidents. The government instructed all-level authorities to arrange rotations of guards to maintain security at villages, offices and organisations throughout the festival. Minister of Public Security Dr Thongbanh Seng-Aphone recently issued an announcement asking security forces at all levels to work harder during the festival to ensure safety and orderliness. Ministers, heads of ministry-equivalent organisations, provincial governors, and the Mayor of Vientiane are required to guide their subordinate officials and the public to ensure the rules in the government announcement are enforced uniformly.